I've been a big fan of the waterproof point and shoot cameras since acquiring the now "old" pentax 33WR in 2003. I still keep this camera in my fly vest, but am always following the newest cameras and dreaming that I might buy an "upgraded" replacement. 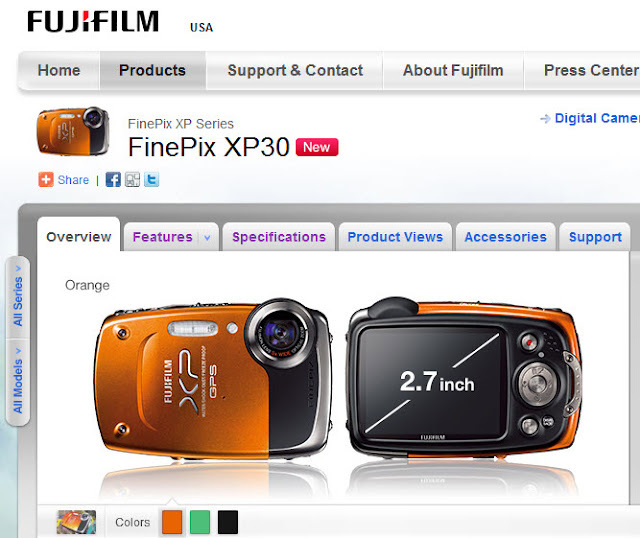 The Fujifilm XP40 XP30 was announced earlier this month as a "pre-CES 2011" announcement. CES is the International Consumer Electronics Show held annually in Las Vegas. The new Fuji has included image stabilization, but more importantly (or perhaps just more interestingly) it has included GPS features. I can see using this whenever I find a "hot" fishing spot on a remote stream. Just take a picture of the location... perhaps, if you're lucky, a picture of one of the fish caught there.... and this will record the location. It is my understanding that it will record the more exacting latitude and longitude and/or simply the place name (such as Yellowstone National Park). According to the press release, the camera has an imbedded list of over one-half million place names around the world. It is waterproof to 5 meters, shockproof up to 1.5 meters, dust and sandproof, and freezeproof to minus 10C. These features are all pretty common on this category of cameras. The screen shot below is from the Fuji Web site. My daughter will be happy that it comes in her favorite color, orange.